2017 UPDATE: The Coolspring corn maze is open until November 5, 2017. Address and hours are available on the Coolspring Corn Maze website here. I caught a glimpse of this thing from the article in the Post-Gazette last Friday and I can’t believe I didn’t find it sooner. The Coolspring Corn Maze is a 10 acre maze of cornfields, which is impressive enough but the whole maze is in the shape of a stage coach. 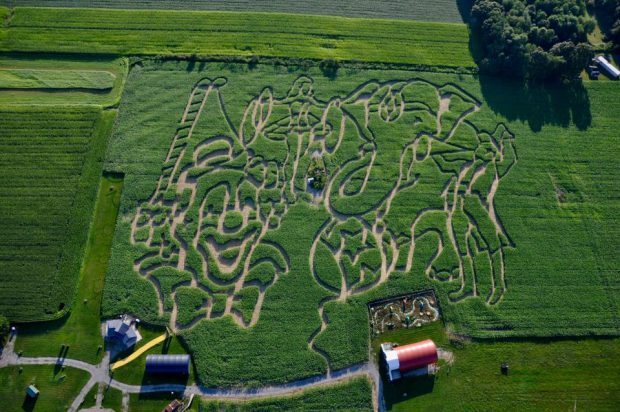 This field of fun is located near Mercer, PA it is probably about an hour and a half drive away from Pittsburgh. This year’s theme is the Wild West, so that explains the stage coach and they have set up a wild wild west town. This family checked out the maze on Oct. 12 – I think it is funny that just two weeks ago they were wearing shorts to check out the maze and now I am sitting here watching the snow falling. I did some asking around about this and I found someone who did the maze last year – you can go at night and try the maze in the dark. They also have hay rides and a farm market too.